• Our purpose is to provide a vehicle for researchers and whistleblowers to get their stories out. • We produce in-depth video interviews, made available free of charge. We also present written analyses and other research. Click here for links to all our material. • Increasingly, we've been receiving standalone messages (on or off record) from inside sources, some of which which will be presented on the page below. 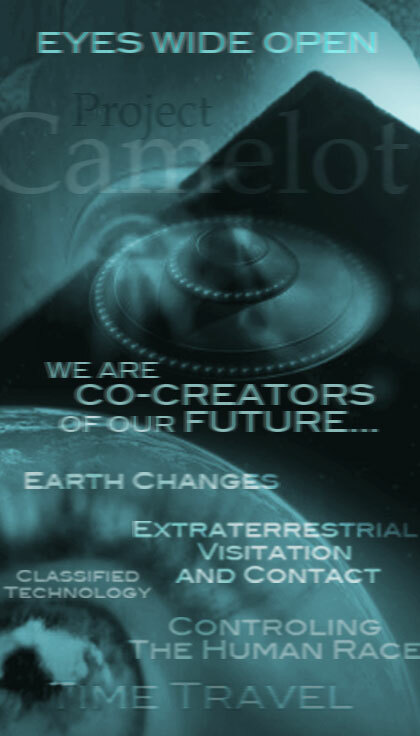 • Our focus is an investigation into (but is not limited to) the following: extraterrestrial visitation and contact, time travel, mind control, classified advanced technology, free energy, possible coming earth changes, and revealing plans that exist to control the human race. Click here for more about our mission. • Point your mouse over each small image for details. • Click on each small image to reach the page for the witness concerned. • Click here for a high-resolution image of the photomontage above. "...We may note at this point while you ponder the possibility/probability vortices that although you have many, many items which cause distress and thus offer seeking and service opportunities, there is always one container in that store of peace, love, light, and joy. This vortex may be very small, but to turn one's back upon it is to forget the infinite possibilities of the present moment. Could your planet polarize towards harmony in one fine, strong, moment of inspiration? Yes, my friends. It is not probable; but it is ever possible." For those of you unfamiliar with the Ra Material, also known as The Law of One, it is highly recommended as one of the best, if not the best channeled material to have come through to our density. • Click here for our recent audio update with Dr Bill Deagle. This interview covers the recent flu outbreak in Mexico and how it may be just a precursor of the real outbreak; Dr Bill's view of the state of Israel and plans to attack Iran; and we give Dr Bill a chance to address the issues many critics have raised over the past few years. One thing is clearly evident: Dr Bill Deagle is a very good sport and quite willing to face his detractors head-on with honesty and without rancor. This recording was done on April 29th and release has been delayed due to numerous audio issues during the recording of it. We apologize in advance for the problems with sound quality but felt the content important enough to release regardless. • Click here for a full transcript of our 27 March audio interview with Free Energy activists and writers Wade Frazier and Dr Brian O'Leary. • Nazi International: Project Camelot interviews Joseph Farrell. And don't miss our recent Jim Marrs interview on The Rise of the Fourth Reich in America. • "God didn't make Rambo, I made him. I recruited him, I trained him, I commanded him in Vietnam for three years. I'd say that makes him mine." We had not talked with Duncan O'Finioan at length since our last meeting with him - when we interviewed him with David Corso in January 2007. Click here for a new 52 minute audio conversation in which he tells us about what he has learned about his programmed alternate personalities, how they operate, and what their agenda is; how he is working, with professional support, with a substantial group of people who have been through similar military programs (four generations of them, sourced in a number of different countries including Russia); and his visions of troubled times ahead in the US. Duncan, who has suffered greatly, is a great-hearted giant of a man and it's our privilege to continue to support him to get his message out. We're delighted that he will be speaking at our coming conference in LA in June 2009. Do listen to this interview. • It matters not what others say about us, all the more so when it is untrue. However, that disinfo and lies are spread by those who we have considered good friends is sad and worth noting. What is crucial for all to understand is that the original work done was done in the light and should stand on its own. People are flawed and their work and information must stand apart. Many great souls who have given so much to humanity were grievously flawed and sometimes under the heel of the illuminati (so-called) or worse. Charlie Chaplin was such a one. • For reasons of integrity, we find ourselves unable to continue to support the work of Michael St.Clair, who over a period of several months has been speaking increasingly disparagingly about us both in public and in private. All we will say is that the remarks he has made about us are defamatory and untrue, and we are extremely disappointed. He does not understand our mission, and has ceased to support it. We have removed his work from our site, and we sincerely apologize to all our friends for whom this may be a disappointment. • Click here for a new Camelot audio interview with Wade Frazier, with a major contribution from his friend Dr Brian O'Leary. The subject is Free Energy, and the paradigm shift which is urgently needed to allow the necessary changes that could literally transform our world. In this in-depth and wide-ranging conversation Wade tells a number of fascinating and important anecdotes from his own experiences, and Wade and Brian offer their considered views on all aspects of the Free Energy problem. We recommend this highly for anyone who appreciated our recent video interview with Brian and who understands how critical these issues are to us all. • Click here for the full transcript of our recent interview with David Icke. • Click here for our new 75 minute interview with Jim Marrs - veteran author, speaker, and New World Order conspiracy researcher. • Click here for a new two hour Futuretalk: Project Camelot: In Conversation with David Icke. We've been in touch with David since November 2006, when Camelot was relatively young. We had an interview arranged then, but David had to cancel due to an emergency; and several later attempts to reschedule it all met with logistical problems. Finally - over two years later! - we caught up with him in Sedona, and were able to sit down for a long conversation with him. In this important video we pay tribute to his life's work, and to the man who is still standing after all these years, still marching on that road less traveled, determined to present what he suspects is the truth - whatever it is. Don't miss this one. • Click here for a major new summary: 2009: a Tale of Two Timelines. It's written as a comprehensive update on our summary article of January 2008, which we called 2008: The Future is Now. • Click here for the full transcript of George Green's two and a half hour 10 January Vilcabamba presentation. • Click here for the transcript of our recent audio interview with Peter Levenda, the author of the acclaimed trilogy Sinister Forces. • Click here for the transcript of our 24 February phone conversation with George Green. • As of today, exactly 1000 people have now committed to our Round Table pledge list, from all over the world. The 1000th member was Ernie du Toit. It's a great honor for us to publish the names of those taking the stand. All donations go to support the work of Project Camelot and Project Avalon. Please note that donations to Projects Camelot or Avalon are not tax deductible for federal income tax purposes. This event will sell out. Please reserve early. We, Kerry Cassidy and Bill Ryan, do not necessarily agree with or endorse all of the views presented here. What Camelot is about is the investigation into the mysteries that surround us. We are all, in a sense, investigators of our world. And while we, as individuals, may not agree with everything presented on our site, we fully support freedom of thought and speech as well as the Quest for truth. "...The government has in its possession "extraterrestrial vehicles," lobbyist Stephen Bassett said. As in flying saucers." • The A NEW WORLD - IF YOU CAN TAKE IT conference in Zurich has now sold over a third of the 360 seats available in the two weeks since tickets went on sale. The Swiss organizing team anticipates that the conference will be sold out in a few weeks' time. Bookings have come in from all over the world (Australia, Austria, Belgium, the Czech Republic, England, France, Germany, Holland, Hong Kong, Luxembourg, Malta, Norway, Poland, Scotland, Slovenia, Sweden, Switzerland, and the USA): this will be a truly international event. Please click here to make a booking if you would like to be there. The dates are 10-12 July, starting after lunch on the Friday. --- Their analysis of Project Camelot's major summary article 2009: A Tale of Two Timelines, described by them as "one of the best papers we have ever read on the subject"
--- Lotus and its implications and evidence. This is their first such public presentation at any conference. Many delegates are traveling to Zurich just to hear this, and to have the opportunity to meet them in person. Click here for all details. • Next week we will be moving host for the Project Camelot domain. Many visitors will be aware of frustrating problems with limited video downloads (which are often curtailed at 125 Mb). We've been totally unable to fix this problem, but this should now be a permanent solution. We're working to ensure that the transfer goes without a hitch, but with over 37 Gb of material on our site (and a peak bandwidth load of 23 Tb per month) there might be some teething problems. Don't be unduly alarmed if despite our best efforts the site is down for a short period at some point. • Athena Thompson, author of Homes That Heal, currently has a mini-forum on our Avalon forum as one of our Consultants in Building the New World. Healer and expert herbologist, Athena has written a new book called ST. CLAIR TWINS: THE FORBIDDEN TRUTHS. I've read it and it's a truly wonderful science fiction novel along the lines of the Harry Potter series. Encapsulated in one sentence--it is the story of twin teenagers who are plunged headlong into an intergalactic war when they discover a time-travel portal on their 13th birthday, leading them into a battle against an ancient race of Greys and Reptilian overlords. Based in large part on information from Project Camelot. • Important article on Solar Winds and the breach in the Earth's magnetic field. I regret to have to announce that Alex Collier has also withdrawn from speaking. Due to the recent speaker cancellations, this conference is now cancelled. I want to thank all the wonderful artists, musicians and speakers as well as all the volunteers who stepped forward to work to make this conference a reality. I also want to thank the investors who were willing to come forward to put themselves on the line at the last moment when it looked as though we weren't going to be able to come up with the necessary financing. I especially want to thank and acknowledge Julie Anderson, who put in many hours working for free to secure a venue; Michael Munsell who created our wonderful Awake & Aware mini-site as well as the fabulous poster for the event; Jon Carling, who created the wonderful rendition of the Camelot logo and brought with him 5 fabulous bands, all more than willing to play in support of the cause. With the short notice and recent cancellations I feel it would be best to set this conference aside until a later time when more advance preparations could be made. I want to thank all the speakers who initially came forward, without promise of monetary compensation and in light of the inexperience of our team, in the spirit of freely sharing what they know and what they have learned with all of us. 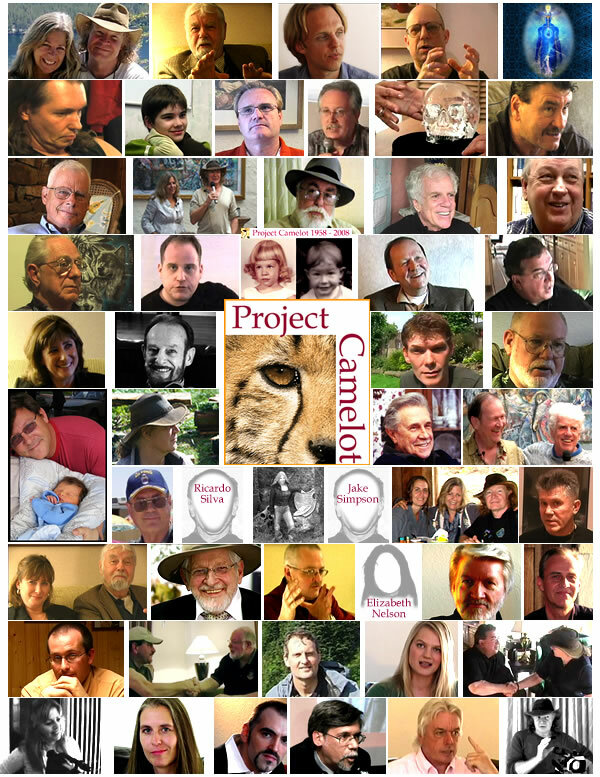 Project Camelot is proud to know you and we consider all of you friends and comrades for life. • I was very disappointed to hear today that recent events have given Kerry no alternative but to cancel the LA June Conference. I was urging her to continue, because Kerry is exceptional in her determination and capacity to make things happen. If it had been possible, she would have done it. I too would like to thank everyone in her team who was working so extremely hard to make it a reality at very short notice. However, Dan and Marcia will be speaking at the Zurich conference in July, where they go on to state... "Information and materials (video, audio, and other) never before disclosed will be presented." • Tickets are on sale for the July conference in Zurich: A New World - If You Can Take It. Please click here for all details. David Wilcock, Brian O'Leary, Dan Burisch and Bill Ryan are confirmed speakers. Since going online three days ago, 50 tickets have already been sold from the maximum of 360. This will quite an international gathering. Most enquiries are from Switzerland, Germany, and the Netherlands, but we’ve also received bookings or strong interest from the UK, Ireland, Norway, Belgium, Spain, France, Portugal, Italy, Malta, Greece, Poland, Slovenia... and even Kuwait, Argentina and Australia. The Swiss Groundcrew - an extremely pleasant and efficient bunch of people who I have greatly enjoyed getting to know - have asked me to convey their warm wishes to their colleagues in other countries, and to Kerry and her organizing team in LA. • We have just talked with Dr Bill Deagle for an hour about the Mexican flu outbreak, the possible plans of the Controllers, and his own personal philosophy. We are editing this, and will release it soonest. "We're co-creators of our own future. We're not VICTIMS of the future. We also have to realize that if someone dies in a third world country, like an 'untouchable' in India, or someone in Mexico City that's living in a garbage heap, WE die: some portion of us dies too. If we allow the use of depleted uranium weapons to kill little girls in Gaza, or if we allow nuclear weapons to drop on the Bushehr reactor and downwind millions die from radiation poisoning, we die too. And if we can feel that connectedness in spirit as a cell in the body of mankind... we would turn back from that." • Click here for full details of the 10-12 July Conference in Zurich, with David Wilcock, Dan Burisch, Brian O'Leary and Bill Ryan as confirmed speakers. Tickets are now available at 180 Swiss Francs [119 Euros, or $158]. Full details of the 6-7 June Los Angeles Conference will be announced very soon. • Late Breaking News: It looks like we have found a venue for our Awake & Aware in LA conference: The Marina del Rey Marriott. On the coast... a great location! Now all we need is funding! Here's your chance -- either donation or for the entrepreneurs out there contact kerry@projectcamelot.org for the upside potential for investing in this cause! • Please visit Rense.com or YouTube for a 24 April Jeff Rense interview with Dr Bill Deagle. Click here for a 25 minute audio of Alex Jones talking with Dr Bill Deagle and NWO researcher Steve Quayle last night. Deagle and Quayle are 100% agreed that the current Mexico outbreak is a probable precursor to several more "waves", one of which will be "the big one". Both state that they had received intelligence quite a while back that a potential pandemic had been planned. In Part 1 of Bill Deagle's 2006 Granada Forum Lecture he goes into this in quite some depth. We have reported on the possibility of this ourselves here, in our summary article 2009: A Tale of Two Timelines. Meanwhile, I fully endorse Kerry's comments below about the power of consciousness, and the importance of staying in observer mode. Our position at Camelot is that knowledge and understanding means strength, and that ignorance - or an unwillingness to face the facts - helps no-one except the Controllers. Stay alert to everything that's going on, and we'll continue to bring you summaries of any information we believe is important and relevant. • There is evidence from one of our sources that this latest pandemic is being used as a distraction to move the attention away from the financial meltdown. We are being sent information from Mexico stating that there has been some effort to tone down the actual impact of the virus in order to safeguard tourism. Let's not forget that Tamiflu comes with its own problems, including side effects like nausea, vomiting, diarrhea, headache, dizziness, fatigue, cough…the very symptoms you're trying to avoid. And let's not forget that Japan banned this drug for children back in 2007, after links to suicidal behavior. Still another source mentioned that every year in the U.S. something like 30,000 to 50,000 die from seasonal flu-- worth noting to keep things in perspective. And for researchers who want to follow this trail of racially targeted viruses... I would encourage them to investigate the links to Promis software, as part of the targeting mechanism that has been in place for some time. It is worthwhile going back over the whole Octopus scenario covered in the excellent book, The Octopus by Danny Casolaro... a journalist who was killed because of its contents... his tribute is on our website. And this all leads to the death of the microbiologists... The links between bioweapons, viruses and Promis software are addressed in this 2002 article from Michael Davidson and Michael C. Ruppert, entitled, A Career in Microbiology Can Be Harmful to Your Health. "Dan is in Houston, Texas, speaking with certain State and Federal health officials, due to the unusual nature of the contents of this Swine Flu virus. We are all happy that this virus is responding to Tamiflu, but there are components to the virus, which Dan correlated to the Avian Flu virus, and which made him "suspicious." A medical professional colleague in Houston had called him, and requested that he attend a meeting to look at the genetics of the viruses to help rule out all other than natural causes, just as a precaution. Additionally, he is assisting in attempting to elucidate what advantages might be obtained by learning about the responsiveness of this Swine Flu virus, versus the reported resistance by some varieties of Avian Flu to specific classes of antiviral drug therapies." Note: Keep in mind the effect here in the States is considered "mild"... Although we are not giving medical advice of any kind here, colloidal silver and/or MMS are both said to be possible remedies or even preventative measures against this type and many other types of viruses. An even better measure is 'consciousness'. Through meditation and other disciplines you can raise your vibrations high enough so that you will not be affected regardless. Do not feed into fear or needless obsessive focus on this.. Step back, be aware, stay in the observer mode. • "The hammer may have fallen." We're following the Mexican outbreak of swine flu very closely. There are a number of well-written articles linked to Rense.com, and a 24 April Jeff Rense interview with Dr Bill Deagle is here. For an big picture overview, we have already discussed the threat here (originally drafted in January 2008) in our major summary article 2009: A Tale of Two Timelines. Many readers will be aware of the whistleblowing report by 'Mary' about apparent preparations by the Department of Homeland Security for a pandemic - reported in a phone-in to The Power Hour on 30 March. If you have not listened to this, we strongly recommend that you do. We have received indirect confirmation from someone in direct touch with 'Mary' that this whistleblower appears to be genuine. We welcome hearing from her if she would like to contact us in full confidence. Click here for the YouTube video (audio only with images). Click here for the extracted MP3. Click here for a transcript of the call. Click here and here for Dr Rima Laibow's report on the Swine Flu outbreak. More immediate, said Jake, was the threat of the deliberate release of viruses... This would trigger worldwide infrastructure breakdown, cause chaos, and make populations easier to control. • Click here for a free online book entitled Severe Space Weather Events - Understanding Societal and Economic Impacts: A Workshop Report. • Click here for a Wired interview with John Kappenman, the author of the Metatech report mentioned by ABC News below. The title of the interview is The Geomagnetic Apocalypse - And How to Stop It. • We have heard nothing more from the electrical engineer whistleblower reported here. The direct result of a space storm would be the breakdown of the electrical grid, the report warned. John Kappenman, an analyst with Metatech Corporation, a company that studies the effect of electromagnetic interference on power systems, said in the report that damaged transformers take a long time to repair. In well-documented cases involving heat failures in the transformers that undergird the power system, he said it has taken 12 months or more to replace the damaged units with new ones. Please click here for our original whistleblower report. In our recent major summary article 2009: A Tale of Two Timelines we discuss the solar flares/EMP threat here. It is also worth noting that in our interview with Dan Sherman back in June 2007 he stated he was trained to be an intuitive communicator (between top government officials and extraterrestrials) for a time in the future when "all electronic communications would be rendered useless." This leads to the question what event (solar?) or as Henry Deacon once said in the transcript of his audio conversation with us here, it is theoretically possible that there may be intentional targeting the grid of certain countries due to a man-made pulse weapon. One must also examine the recent emphasis on solar flares or 'space storms' and determine whether these will be a natural occurrence as a result of our movement into the Galactic center or is the media which serves the dominant paradigm preparing to cover a future targeted attack by the Illuminati with plausible deniability? • Major Rick Gibney, the F-16 pilot who was claimed to have fired the missile. • Discussion of the Rick Gibney story. • Testimony that a live missile was fired by an F-16 that morning. • Video of a Rumsfeld slip of the tongue suggesting that Flight 93 was shot down. George Green, Miriam Delicado, Dan Burisch & Marci McDowell and Kerry from Camelot. We are also graced with the talents of a well known artist Jon Carling who is designing a poster for the event along with several very talented bands who have volunteered to play for the event. We have a team of over 20 amazing volunteers working behind the scenes to organize this event as well as the possible addition of a very savvy program director tba. Below: Jon Carling's rendition of the Camelot logo! - I (Bill Ryan) am willing to stake my reputation on the fact that this young woman is recalling her actual experience to the best of her ability. I have spent time with her and am 100% certain she is telling the truth as best as she recalls it. - She does not KNOW that this was Flight 93. This was my surmise: she does not remember the flight number being stated in the conversation she witnessed. - She does not KNOW that the plane was actually shot down. That was her assumption. All she witnessed was the decision. - The words "brought down" or "shot down" do not imply that (e.g. if the plane was hit by a missile) there would be a fuselage on the ground. - The teleconference she found herself witnessing was not initially called because of the rogue plane in restricted airspace. It was called because of the widespread emergency of that morning. She happened to be there because events spiraled out of control. She had no clearance and was there merely as a very junior 'gopher'. The situation about the unresponsive aircraft arose after the meeting had already started. Those in the military with experience will confirm that these events can sometimes happen exactly as described. - Listen to the audio as well as read the transcript. The audio quality is very clear and Elizabeth's voice is not disguised. Her authenticity is available to be assessed. - While many dozens of people have written to us with appreciation for Elizabeth's testimony, I have little sympathy with anyone who has the idle opinion that this must be disinformation. It is not. This new information raises more questions than answers, but that is nothing new in this arena. Elizabeth is a very brave person who's done her best to help us all understand what happened that day on 9/11. Camelot connected with her through a chance meeting after she had become familiar with our work. I've not seen her since February, but she is a spiritual person with a big heart and, as she explains in her interview, has been carrying this load for some time. Every other genuine whistleblower will understand. • 911 Whistleblower interview: Earlier this year we recorded an audio interview with a young woman - Elizabeth Nelson - who was present, on military duty, in the room where the decision was made to shoot down United Airlines Flight 93 over Shanksville, Pennsylvania on 11 September, 2001. Click here to listen to this extremely important - and possibly unique - 911 whistlebower interview. • Awake & Aware in LA - Camelot Conference - we are looking for a small team of organizers to get this off the ground. Please email Kerry@projectavalon.net if you want to help organize. • Future Threat to Global Electric Grid: We have been contacted by the wife of an electrical engineer who has been officially briefed about a serious major threat to infrastructure in a few years' time. Hi Bill: My husband is working away from home at the moment on this problem, and I have no way of contacting him. He is not allowed to carry a cellphone on the job. I'll clarify with him when I speak to him next, but the impression I got was that it was definitely going to happen. He mentioned something about electromagnetic clouds in space that the Earth is drifting into. They are under incredible pressure to find a solution. My husband is an engineer, a man of rational logic. He is not prone to flights of fancy, but this news has disturbed him no end. Please click here for the entire correspondence, and all the information we have been able to learn. We have updated our latest major summary 2009: a Tale of Two Timelines with this new information, in section 11 [EMP spikes from increased solar activity (solar cycle 24)]. • First week in June 2009: Project Camelot in Los Angeles - Awake and Aware -- prospective conference - We are planning a 1 or 2 day conference in the Los Angeles or Santa Monica area and are asking that people who are interested in attending or helping to organize it please contact us at groundcrew@projectavalon.net with the words: "AWAKE AND AWARE" in the subject line. Please let us know if you or someone you know can provide (DONATE or at very low cost) -- a Venue -- that seats anywhere from 100 on up... to be honest, we have no idea how many people will attend. We are also very interested in reaching the Hollywood Community, known and unknown to attend and take part. If you know someone with a following who would want to help sponsor this event please let us know. Kerry from Project Camelot, George Green, Miriam Delicado.. and other Camelot witnesses and friends who will also be invited to speak depending on whether funds for their travel could be arranged. Miriam Delicado and George Green are now confirmed pending the venue and exact dates. It's up to you! Let us know who you want to see and let's make it happen. Write to us and tell us who you would like to see speak and how many people you feel we might expect to attend. We will try to keep the cost very low... in the vicinity of $10-20 a person with the option to donate at the door according to your ability to pay or bring a guest for free (for the price of one ticket). Any bright ideas are welcome. Please understand we will read your emails but may not be able to respond depending on our time. • 10-12 July 2009: Project Camelot in Zurich: A New World - If You Can Take It. Dr Brian O'Leary will be in Zurich in July - and will be speaking at a conference here organized by the Switzerland Ground Crew, an energetic group of some 20 people based in Zurich who are working closely with Bill Ryan. Brian will be joined by Bill and several other speakers whom the organizing team plans to invite. Brian will be speaking on The Energy Solution Revolution, and will recount anecdotes from his life from his early days in the NASA Astronaut Program and meetings with many of the world's premier Free Energy activists. Bill will be speaking in depth on the recent Project Camelot major summary: 2009: a Tale of Two Timelines. 100 people have already expressed interest in attending, and there are 360 places. The event will be held at the Zurich Volkshaus and will begin on the Friday evening 10 July, ending at 5 pm on Sunday. Anyone interested in attending please write to groundcrew@projectavalon.net with the words "A NEW WORLD" in the subject line. We'll keep in close touch with you regarding the details of both conferences in LA and Switzerland. At present, it's not clear whether Bill will be able to speak in LA, or Kerry in Europe. Travel costs will be a part of this equation. What we want to do in Camelot is reach as many people as possible personally, at the same time enabling the same very high quality of Ground Crew networking as we experienced in Ecuador in January. Summer Conferences on both sides of the Atlantic are part of this vision. • New release: Our Futuretalk video with David Icke. See opposite for full details. For those visitors new to our site, who may be unfamiliar with our core work and provisional personal conclusions on a number of issues, we cannot recommend these documents too highly. The 2009 update includes the 2008 original, comparing developments item by item. Our view is that they are both must-read items for any serious students of the future. When we reviewed the original 2008 article, we were impressed with how little we had got wrong... and simulaneously, how significant are some of the possible differences and developments: hence the title. It was motivated in part by the extremely positive response we've received for our January 2009 Vilcabamba presentation, which (for those who prefer the format) is a stand-up narrative account, entertaining and energetic, of everything we report in this latest 2009 summary. Enjoy. Kerry and I are looking forward to 2010. Addtional note: We have just added some last minute information from Dan Burisch and Marci McDowell which was not included earlier this morning when we originally released this article. The new updates can be easily located as they are in italics. Further updates may be added as more information is coming in regularly. In the last 24 hours, for instance, we have received a message from the insider source we have named Hawkeye - our first since the end of October - and we will share this information here in the next few days. Scientists are concerned that the recent quakes in the Salton Sea area may trigger the 'big one' in the Southern California area. "Scientists are closely watching the increased earthquake activity because it is near a section of the San Andreas Fault that has not broken loose in more than 300 years." This indicates growing activity along the Ring of Fire and has links to the San Andreas fault which runs the length of California -- and could be triggered further as a result of these eruptions. • Australia bans Wikileaks.com along with others as blacklisted site: Take a look at this Sydney Morning Herald article. Wikileaks plans to release the entire list of blacklisted sites for Australia and has previously published blacklisted sites from Thailand, Norway and Denmark. Wikileaks is a non-profit project, "sponsored by transparency groups and investigative journalists worldwide," according to their webpage. Project Camelot would like to encourage whistleblowers to become aware of this great resource for leaking untraceable documents. On their About page, they state: "Wikileaks provides simple and straightforward means for anonymous and untraceable leaking of documents." Please post this email on your websites, pass onto your email lists and let as many people know as you can. The Hopi Traditional Leaders are not participating in the Return of the Ancestors event in April and it is critical that people become aware of this fact as the organization ICA is not being clear with people as to who it is that will be attending and taking part from the Hopi. It has come to my attention that the Traditional Leaders of the Hopi people are not participating in this event. The Hopi that are taking part in this gathering are not the Wisdom Keepers of the Hopi and do not hold the Sacred Knowledge of the Prophecies. ICA and Adam Yellowbird as president of the organization made the decision to tell the world of the event between the Maya and the Hopi without consulting the Hopi Traditional Leaders first. There are those from the Hopi people that have chosen to participate in this event but those individuals have been asked by the Traditional people to remove all mention of Hopi in this gathering. These people are not the Wisdom Keepers of Hopi. The concern of the Hopi Traditional Leaders is the possible misrepresentation by ICA and by some of their own people that have disregarded any and all concerns of the Traditional Leaders and Wisdom Keepers of the Hopi. If this event continues it must move forward with respect to the people in which it is being made for. Respect by sharing the truth that this is not the Eagle and the Condor event that many believe it to be. This cannot be fulfilled without the TRUE Wisdom Keepers of the Hopi and they have chosen not to participate in this event. Already people have begun to gather from around the world on the Sacred Hopi Lands. Sacred objects have been trampled and Hopi Ceremony disrespected. These actions were being made by people who did not understand how they were affecting the Traditional Hopi ways. This is one of the reasons they have chosen not to participate in this event as the Traditional Ceremonies and life of the Hopi has been overlooked. The Hopi Traditional Leaders are aware that the world is calling for them to begin to step forward and they are at this time following Traditional paths to determine if now is the appropriate time to come forward for the earth and humanity. Great care must be taken as the Prophecies and Ceremonies have continued for thousands of years by the Hopi people. They wish to Honor and Respect those of the past as well as those of the future by participating in a gathering that is for all people and the earth itself. • Click here for a five minute C-Span video (Rep. Congressman Dan Burton, 12 February 2009) which is the clearest and most simple to understand warning of the imminent economic problems faced by the US that we have yet heard. • From Avaaz.org: Risking danger to speak out for their jailed friends, Burmese activists this week demanded the release of Aung San Suu Kyi and all political prisoners and called on the world to help. As the global economic crisis makes aid flows more essential, Burma's generals are becoming more vulnerable to international pressure, but we need a flood of petition signatures to UN Secretary-General Ban Ki Moon to make this a top priority. Follow the link to sign the petition, and forward this email on to make sure she and her fellow prisoners are freed:Burma's peaceful pro democracy activists are calling on UN Secretary-General Ban Ki Moon to secure the release of political prisoners. Stand with them -Sign the petition. • Project Camelot Live at Vilcabamba: As many of you know, Project Camelot made a recent trip to Ecuador to speak at a two-day conference hosted by Dr Brian O'Leary, ex-NASA astronaut and prominent Free Energy activist. This is one of the few times Project Camelot's Bill Ryan and Kerry Cassidy have appeared on stage together to present their research. It's entertaining and full of up-to-date information, and we highly recommend this as a full summary of our work to date. Other conferences where we have appeared are: the NEXUS Conference in Australia, October 2008, where we have been invited back this year; the Crash Retrieval Conference, November 2008; and also at the Alamo Conference, March 2008, where we will be appearing there again this coming May - Kerry for sure, and Bill if funding can be obtained for his travel from Europe. I noticed that people are wondering what is going on with Bill and I and why aren't we showing up on the forum. First of all I want to acknowledge and thank all the moderators, researchers, transcribers and other volunteers who contribute to making our forums and websites a success. We also thank everyone for all their efforts to discover the truth and then to share that truth. We salute your efforts. In addition, I thought I might try to answer the question put out there by several of you, regarding why we don't spend time on the forum.... As many of you know we are often traveling and filming interviews. Once we return from those travels we end up taking care of editing and posting the interviews -- all of which takes weeks of full time work. We are always behind in our work and so catching up takes most hours in the day. For those of you who wonder what is happening with the funds created by the subscriptions and donations, currently we are still paying off credit card debt that we ended up with at the end of 2008 mainly due to our trip to Australia which was largely self-financed. We are not able at this time to travel to do more interviews until this debt is paid off. At the moment we have, thanks to the generosity of all of you, paid off most of it but there is a remaining $4,500 approx. that still has to be paid before any incoming funds can go to future interviews. The recent travel we have done was financed in large part by a Camelot supporter who wishes to remain anonymous. And we are very grateful to them. I am moving back to California after living 6 months in Sedona (a fabulous place!) because I want to work on various screenplay projects and being in close proximity to Hollywood will facilitate bringing those ideas to the screen and last but not least, I miss the ocean!! As many of you know, Bill is living in Switzerland. We continue to work daily on Camelot and hope to be able to set aside more time for creating tele-conferences on Avalon in the very near future. Due to the distance between us it is often difficult to synchronize our efforts and what we have created with Avalon and Camelot takes all our time and still we do not accomplish all the things we would like. As we enter this time of great change and transition there are new demands on all of us. While we continue to expand our efforts to detail the Big Picture, the picture itself is changing radically. It's a demanding challenge to try and keep up with the ever changing landscape and be productive at the same time. We appreciate all the love and support we have been given during the past 3 years and hope to continue to provide thought provoking interviews and reports in the coming days. ..."if you build it they will come"